The white mobility cane—a badge of strength and boldness. It enables us to do most anything. What would we do without it? Indicating a person is blind or visually impaired, the long thin white cane is more than just a tool for its users. It’s a way to take back our lives, regardless of where we fall on the sight loss spectrum. But a white cane can also mean different things to different people. 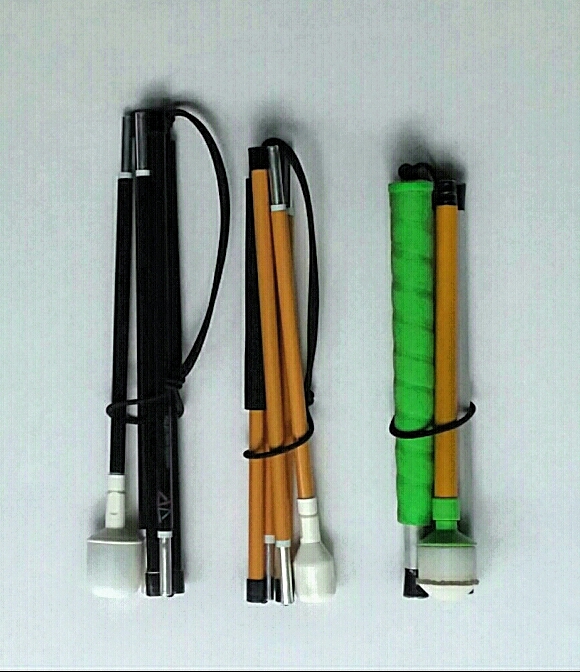 For the blind and visually impaired (B&VI), a cane can be an incredibly useful tool. It grants us a significant amount of freedom and mobility depending upon our ability and level of sight loss. But it also can have much stigma as we deal with acceptance of blindness, particularly by someone who is recently blinded. When I was given my first cane, I admit I was devastated. I realized that I had transformed from being a woman who had sight to a woman who became blind. That was tough. Suddenly, I was viewed by society as a person with a disability, not a whole person. But now I love my cane—and beyond just its functionality. My cane represents more than just my blindness. It has become a part of me, a part that is loved and accepted by anyone who truly loves and accepts me. Even my sighted friends love it, as they see my ability to accept and adjust to my situation. Without judgment or marginalization, they appreciate how I can function just like anyone else. But wait, there’s more! I’ve always loved fashion and style, so I asked, why can’t I use my cane beyond its role as a mobility device? Why can’t it help express my inner sense of being, much like my hair, makeup, clothes, shoes, and jewelry? Why not personalize it to make a fashion statement as to who I am as a woman? As a mobility tool, a cane, of course, needs to be reflective and visible, particularly to drivers. But there’s a lot you can do to “bling out” a cane, without jeopardizing its functionality and safety features. For example, there are canes with handles and tips in a variety of colors such as neon blue, green, pink and orange. There also are canes where the shaft is a matching color instead of white and red. But you need to go with an overall color and style you are comfortable and feel safe with. Our recommendation would be to bedazzle portions of the cane such as the handgrip, the section just below the grip, and the strap—an easy solution to creating a personalized fashion statement. To express my inner self, I decided to decorate mine. Here are some tips and ideas for those who are still new to having a cane, since it really helps with the self-confidence—at least for me. Decorate for holidays, events, parties, and just for fun! Now with a little bling and glitz, my cane tells a story about me—a whole person beyond just my blindness. And since we’ll be together for a long time, I plan on having lots more fun with my cane. So, bling out your cane and enable your inner fashion sensibilities—and be a bold, blind and beautiful woman! I love the rhinestone adorned handle. It’s so sparkly and I love the tactile feel. I know I would, too! Novel ideas. I like the notion of cane decor. I’m not blind, but I use a cane sometimes for safer mobility. I don’t know any reason not to bling it with your ideas.